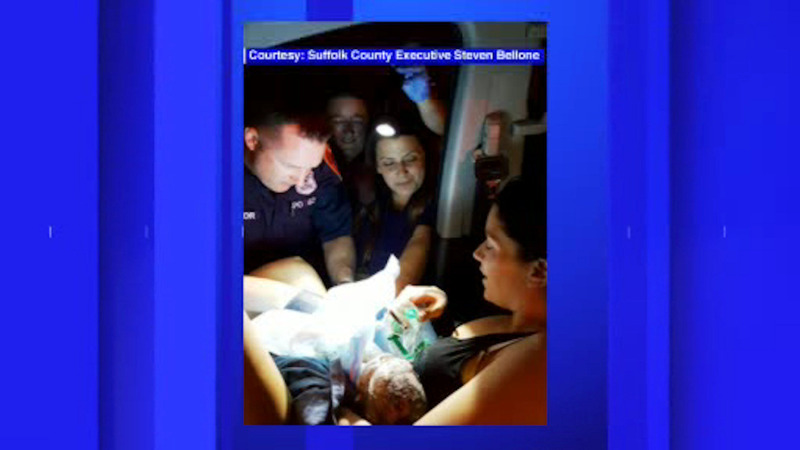 YAPHANK, New York (WABC) -- For one family in Suffolk County, the birth of their baby in a parking lot on Wednesday morning will be a story they'll never forget. After the mother went into labor that morning, the father got her in their car and immediately started making his way to the hospital. The couple was driving on County Route 111 in Manorville shortly after 9:30 a.m. when they realized that they wouldn't be able to make it to the hospital in time. They then pulled over into the parking lot of a nearby Starbucks and called 9-1-1. Suffolk County Emergency Services Dispatcher Marlo Van Houten answered the call and then began instructing the father on how to assist in the delivery. Van Houten also instructed the father on how to tie off the umbilical cord and how to keep the baby warm until medical personnel could get to the scene and transport them to St. Charles Hospital in Port Jefferson. "Once again, our emergency services personnel were able to quickly come to the aid of a family in need," Suffolk County Executive Steve Bellone said. "I commend Dispatcher Van Houten for her calm and professional approach to ensuring the safety and well-being of this family." The baby was named Sailor Jewel.